1/ Close tabs more easily — The new Safari in iOS 8 boasts an eye-popping view of all your open tabs – just tap the Tabs button to see your tabs stacked in a scrollable 3D stack. But to close a tab, you need to tap the tiny X in the upper-left corner of the tab. It’s doable, but it can be tricky, especially if you’re trying to use an iPhone with one hand. Instead, just swipe the tab you want to close from right to left. 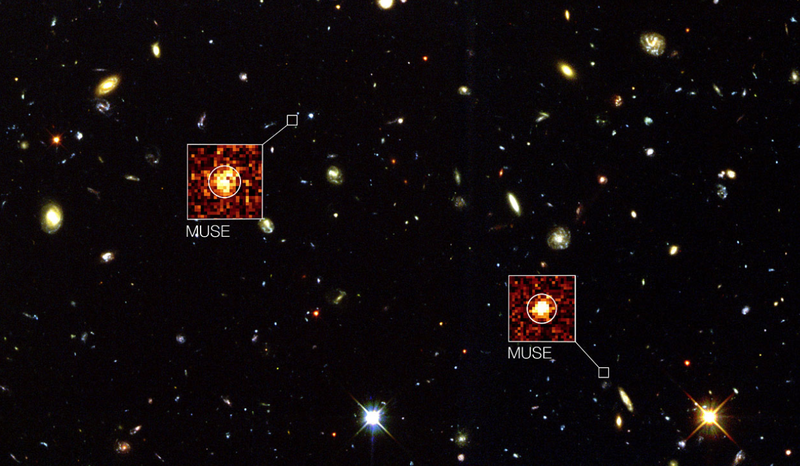 (Left to right won’t work.) It’ll slide off the screen, closing itself in the process. 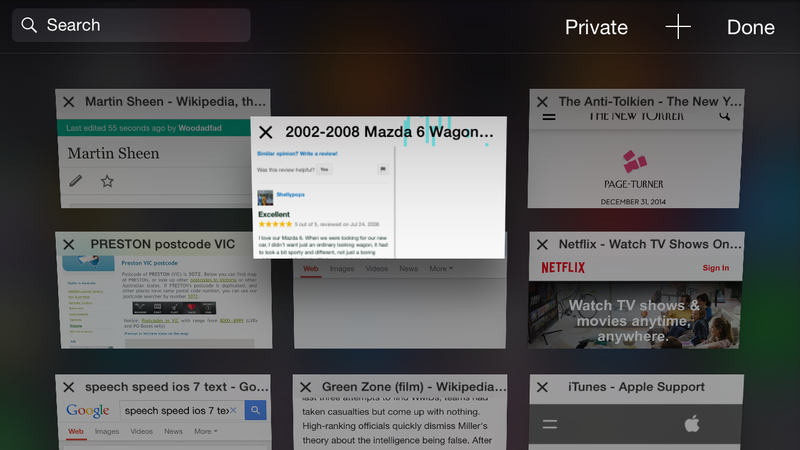 3/ Hold the Back button — No need to dig into your History to see your recently visited pages. Instead, just tap and hold the Back button. Now you can jump back two, three, five, or 10 pages. when you tap-and-hold the Back button (the left-facing triangle at the top left of the Safari screen), you get a History list of the pages you visited recently in that current tab. 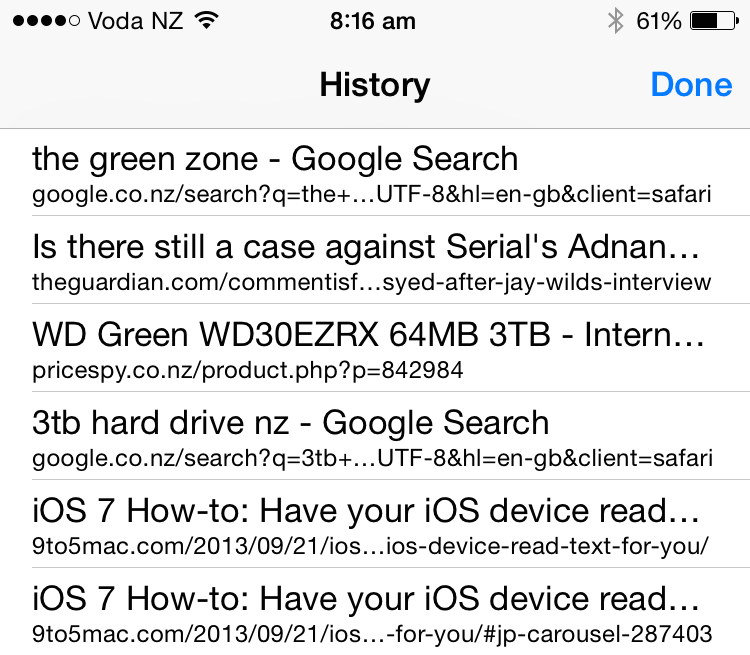 (To see your history across all tabs, you still have to go to the History list in the Bookmarks menu.) 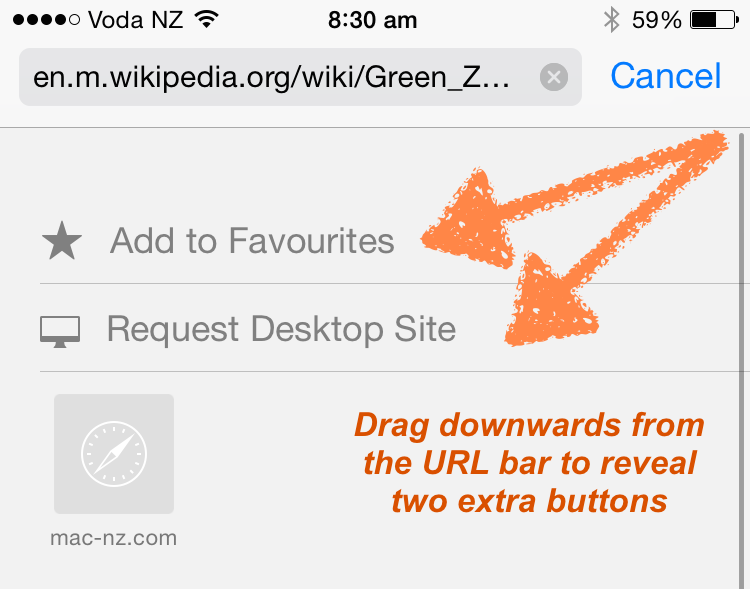 Tap a page in the menu to jump to it, of course – and this trick works with the Forward button, too. 4/ swiping through pages — Speaking of the Back and Forward buttons, there’s no need to tap those buttons to back up or skip forward one page. Instead, starting from just outside the edge of the screen, swipe from left to right to go back. To go forward, swipe from right to left. 5/ Swipe to close a tab on another device — To close a Safari tab on your Mac desktop using the iPhone in your hand, if all your Macs (running Mountain Lion or later), iPhones and iPads (running iOS 6 or later) are connected to your iPhone account, you can already view all the open Safari tabs on any of those devices, thanks to iCloud Tabs. If you swipe one of those open tabs from right to left, a Delete button will appear. Tap it to remotely close the open tab on the other device. It can take up to a minute, though. Extra — hidden Safari buttons — Just pull down the Favorites [sic] window to reveal a pair of hidden Safari buttons called Add to Favorites and Request Desktop Site. 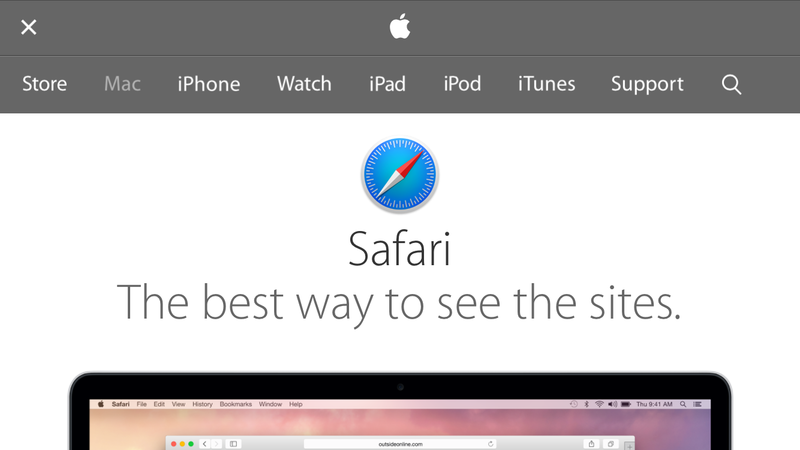 When you tap the address bar at the top of the screen, a window with buttons for all your Favorite sites will appear. Usually you’d just tap one of those icons to jump to that site, or type a search query or URL into the address bar itself. But if you pull down on the Favorites window, you’ll see two more options new in iOS 8: ‘Add to Favorites’ adds the current page to that Favorites grid, and ‘Request Desktop Site’ requests the full desktop version of the current page, instead of its mobile-optimised version. Neurio, just launched in the US, is an app-connected home intelligence technology that makes your ordinary appliances smart and your home more efficient. Apple kicking off Watch advertising campaign in the March issue of Vogue — According to AdAge, Apple may use Vogue magazine’s glossy print ads to introduce its Apple Watch wearable to fashion-conscious consumers. The campaign is expected to kick off in March, approximately a month ahead of the device’s planned April launch [as above, and to coincide with spring fashion collections]. Thanks to ‘Serial’ and Apple’s Podcasts app baked into iOS 8, podcast listens grow 18% — Though podcasts are not a new medium, the format has seen significant growth over the last few months, attributed in part to the fact that Apple’s Podcasts app is now built in to iOS 8. Neurio has only one sensor that brings smart-home capabilities to the entire home. As the ‘brain of the home,’ Neurio connects both older appliances and newer ‘smart devices’ to allow users to easily track, monitor and better understand how their home is operating, such as letting the user know when their kids come home, or if they forgot to turn something off before leaving for the day. Apple’s iPhone commands record high 89% of smartphone profits while Android plummets to record low — Last quarter, Apple’s iPhone took a record 89% share of smartphone operating profits, directly causing another record for the holiday shopping season: an all-time low for devices running Google’s Android. Getting Office, Dropbox, and your photos to work together on iPad — If you’re using the current versions of Word, Excel, or PowerPoint on your iPad (but not, unfortunately, OneNote), you can easily open a file that’s residing on your PC — assuming it’s stored in your PC’s Dropbox or OneDrive folder. Once you’ve set it up, your online storage service of choice is just one of the locations in your app’s File screen. Apple partner Imagination unveils PowerVR ‘super-GPU’ with 512 ALU cores for game consoles — Imagination Technologies, the company that designs for graphics processors used in Apple’s A-series chips, unveiled the PowerVR GT7900 on Thursday, a so-called “super-GPU” that will power affordable game consoles … and that could be a candidate for a future Apple TV refresh. 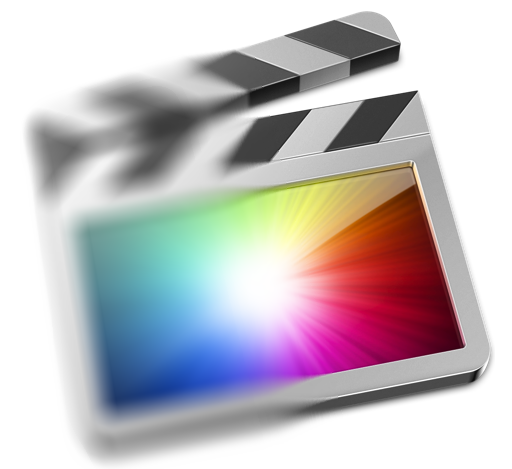 Final Cut was used extensively in the forthcoming movie Focus. Apple highlights Final Cut Pro and its role in Warner Brothers movie ‘Focus’ — Ahead of the February 27th release of romantic comedy Focus, Apple has provided a detailed look at the role Final Cut Pro X played in the production and development of the motion picture. Tim Cook to deliver May commencement address at George Washington University — Apple CEO Tim Cook will deliver the keynote address to graduates at George Washington University, reports GW Today. Cook, along with Anthony S Fauci and Carole Watson, will receive an honorary doctorate of public service. Cook was nominated by GWU students and accepted the invitation for the May 17th event. Spotify adds song lyrics, gets more social on PCs — The popular music streaming service is tweaking its desktop app to display song lyrics as you listen. Spotify’s new music lyrics feature is powered by Musixmatch, one of the most popular apps in Spotify’s catalog. Apple dropped as supplier by Chinese government — Apple is among the companies China has officially dropped from its state-approved technology buying list—a move that was unofficially revealed several months ago. The change means Chinese government agencies can’t purchase iPhones, iPads, or Macs. Skype 7.5 for Mac now available — Skype 7.5 for Mac is now available from Microsoft, and the app is adding localisation for a number of new languages as well as tackling some performance issues. Skype is a free download in the first place. To get it, open Skype, choose ‘Check for updates’ from the Skype menu. Love with databases over for Mac users — A few years ago, you could select from a fairly wide range of database programs (many on the PC including the still formidable MS Access, a few on the Mac) that allowed us to keep track of our CDs, records, books, wine bottles and whatever we were collecting. Not any more. More cities get Flyover support. Apple expands Maps Flyover support to 9 new locations — Apple recently added nine new cities, including Venice, Italy, to the list of locations sporting 3D Flyover support. On the Mac, this is basically 3D. On iDevices, it’s a real tailored flyover – here’s how. Apple CEO Tim Cook visits Israel, meets with President Reuven Rivlin — Apple Chief Executive Tim Cook was in Israel on Wednesday, and had a meeting with President Reuven Rivlin, as Apple prepares to open a new office in the country. Apple pays up in Smartflash case — As reported by Bloomberg, a federal jury found Apple guilty of infringing patents held by holding company Smartflash LLC. Filed in 2013, the original lawsuit claims that the iTunes Store, the iOS and Mac App Store, and Apple’s other transaction services infringe on three Smartflash patents that cover “data storage and managing access through payment systems.” The company originally was seeking $852 million in damages, but was awarded $533M as part of the jury’s decision. 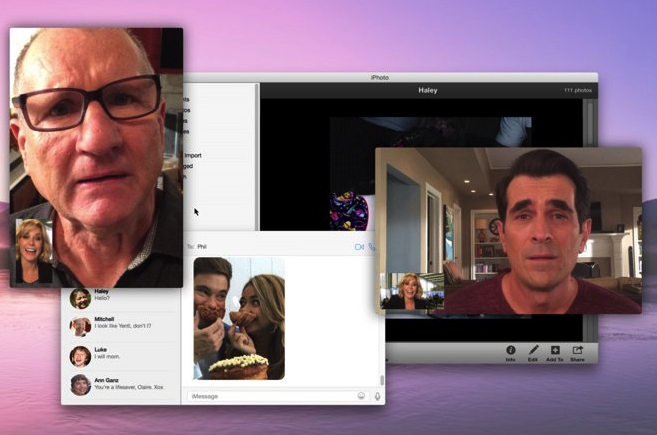 An upcoming Modern Family episode will play out on a Mac OS X desktop, and it’s shot entirely with Apple iDevices. Modern Family co-creator details episode shot entirely with Apple products — In a behind-the-scenes look at an upcoming Modern Family episode shot completely on iPhone 6 and iPad Air 2, co-creator and executive producer Steve Levitan said using the iOS devices didn’t dramatically change the production process, and revealed that tomorrow’s show is not the first time producers turned to Apple’s handset for in-show footage. Apple Pay adoption keeps climbing: Chase says 1 million customers are now on board — Chase’s early numbers on Apple Pay adoption are promising: more than a million of the bank’s customers have added debit and credit cards to the service since it launched last October. Five apps for signing documents with your iPhone and iPad — These five that cover all the bases, letting you sign, fill out forms, connect to your cloud storage accounts, and use’s iOS 8’s share extension, among other features. 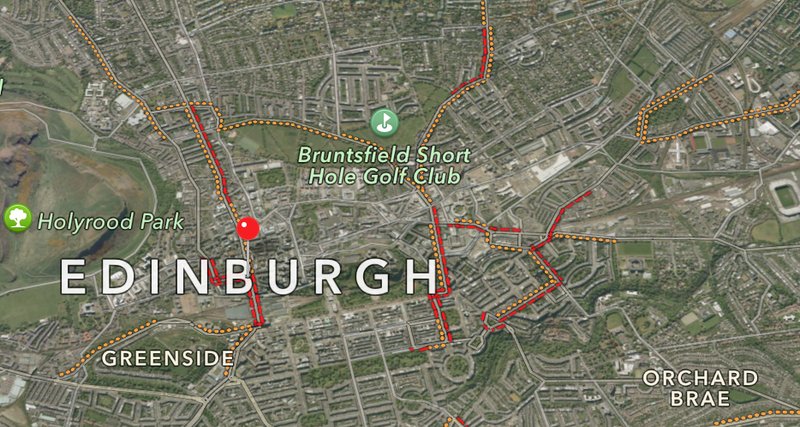 Microsoft Band adds MapMyFitness & HealthVault support, but still no Apple HealthKit — The wearable fitness tracking Microsoft Band received an update this week adding support for biking, and integration with MapMyFitness and Microsoft’s own HealthVault service, but it still lacks compatibility with Apple’s HealthKit tools and Health app for iOS 8. Forcing iCloud Contacts & Calendars to Sync — If your iCloud calendar or contact data isn’t syncing between your devices, an important troubleshooting step is to figure out where the bottleneck is. Here’s how to fix it. Wacom Bamboo Stylus Fineline — Steve Sande reviews the new fine-tipped, pressure-sensitive stylus. New emoji options can be found in the second betas of both iOS 8.3 and OS X 10.10.3. 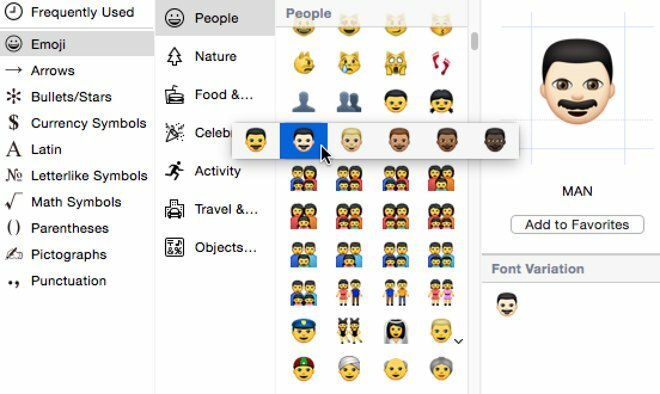 Apple introduces emoji diversity options with latest iOS 8.3, OS X 10.10.3 betas — Starting with the latest betas of iOS 8.3 and OS X 10.10.3, new alternate skin colour options are available when selecting emojis of people and faces. In addition, Siri has added a host of new languages on iPhone and iPad. Visa’s latest move in Europe signals Apple Pay is on the way — Visa Europe is prepping the continent for widespread mobile payment rollout with its new tokenisation tech—the same kind of tokenisation that makes it possible for Apple Pay to function securely. Tweetbot for iOS gets Twitter video and GIF support in latest update — Developer Tapbots has released an update to its popular iOS Twitter client Tweetbot for iOS, bringing playback support for videos and GIFs hosted by the ubiquitous microblogging network. Adonit’s Forge app is built for iPad brainstorming — Adonit is tired of sitting on the sidelines as others build software to work with its line of iOS styluses. Forge, the company’s first app, has been two years in the making, but it’s more than a simple sketch app — it’s a brainstorming tool. Pro lens kit for iPhone 6 — The just released ExoLens kit for the iPhone 6 (iPhone 6 Plus lenses will come in May) is a professional pair of lenses, 3x telephoto and wide angle that attach to the iPhone 6 with a sturdy lattice mount. The mount is also threaded with a standard 1/4″-20 tripod connection. 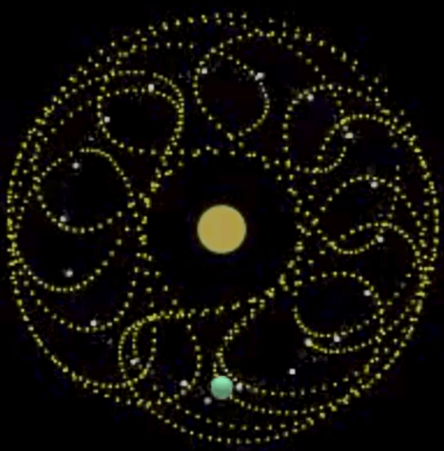 The system is designed for growth. 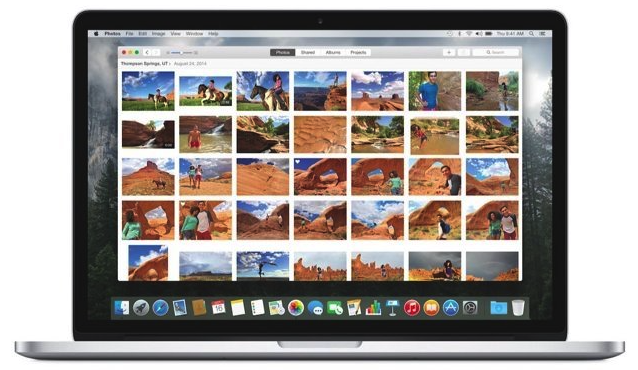 The new Yosemite beta for developers is working through issues with the new Photos app. Desk v 1.2 update adds visual themes, separates WYSIWYG and Markdown modes — Developer John Saddington’s Desk (US$29.99) is a simple-to-use editor with some surprising power built into it. Now Desk has been updated to version 1.2, adding some new features while retaining all of its user-friendliness. Apple closes in on $775B market cap, now twice as large as No. 2 Exxon Mobil — Apple stock hit a new high of $133 at the closing bell on Monday, rocketing up 2.7% on the day to grow its market capitalization to just under $775 billion, a number two times larger than second-largest publicly traded U.S. company Exxon Mobil. Copy, Paste, Repeat: finding the best clipboard manager for Mac — OS X’s clipboard has always been a transient storage place, intended to hold whatever you copy or cut just long enough to paste it somewhere else. Once you copy something else, that new snippet overwrites whatever’s already on your clipboard. Joe Kissell looks at clipboard managers. Apple introduces new crash reporting service for developers in latest Xcode 6.3 beta — After releasing a fresh beta of Xcode 6.3 on Monday, Apple outlined a new crash reporting service that will help developers target, fix and track problems directly from the development tool. 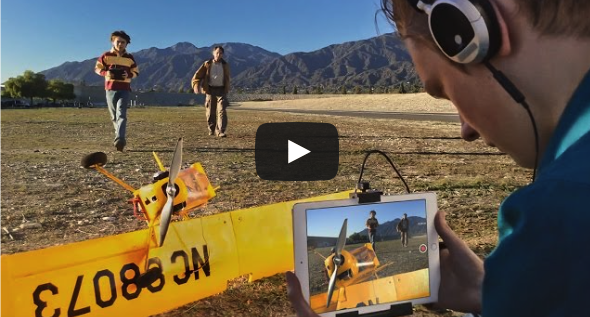 Apple’s latest iPad ad was shot on an iPad. Movie-themed Oscars iPad Ad Shot on an iPad — Apple premiered its newest iPad commercial during the Oscars on Sunday night. The ad, which shows high school students filming movies with iPads, was shot on iPads, too. Martin Scorsese provides a voice over extolling the importance of exploring our creativity, and like Apple’s other iPhone and iPad ads, it is more about empowering users than touting device features. Marvel Contest of Champions is a surprisingly fun and fantastic-looking comic book fighter — Free-to-play games often look appealing, but it’s difficult to know at a glance whether the business model is insidious and fun ruining, or reasonable and worth pumping a few bucks into. Marvel Contest of Champions is an impressively-produced free-to-play fighting game that pulls top heroes and villains in from all corners of the comic universe. BrydgeAir Keyboard for iPad Air/Air 2: almost perfect — The original Brydge Keyboard for iPad was a nice product, but the company had grave customer service issues. Now, under new ownership, Brydge Global, the BrydgeAir continues its tradition of physical excellence with a model for the iPad Air and Air 2. iPad color matching and many small refinements have been added. Developers discuss future Apple Watch apps — As the Apple Watch’s release date looms, developers are discussing their plans for the device. Wearable.com asked several developers about their plans, and came away with some interesting glimpses of what’s to come. There are 21 third-party Watch apps referenced in Wearable’s article, including many screenshots. Apple Watch could be more secure for the visually impaired — Thefts of IOS devices are nothing new. The devices command a premium resale price and can be relatively easy to steal from unsuspecting commuters on public transit systems. Alex Jurgenson thinks the Apple Watch will help. Stanford researchers develop method for tracking mobile devices using battery charge data — Privacy advocates have long tried to educate consumers on the perils of giving apps access to GPS data, but a group of Stanford researchers has developed a method to infer a device’s location from a seemingly much more innocuous source — battery charge information. Google releases YouTube Kids iOS app — Google has released the new YouTube Kids iOS app, providing kid-friendly videos through a bright, easy-to-use user interface. It’s the official children’s programming app from YouTube, with favourite content from Sesame Street, Thomas & Friends, Dreamworks, Mother Goose Club, TuTiTu, and Super Simple Songs. Kids can also search for age-appropriate content on any topic they’re interested in. Latest Apple Mystery Van sightings join previous sightings sent from tipsters in Madison, Wisc. ; Coral Springs, Fla.; Richmond, Calif.; New York; and Panama City, Panama. Apple Investing €1.7B in European Renewable Energy Data Centres — Apple is planning on investing €1.7 billion into two new data centres in Europe scheduled to open some time in 2017. The facilities will be powered entirely by renewable energy and are set to be built in Denmark and Ireland. MacTech announces 2015 MacTech Pro events in nine US cities — MacTech Magazine has been around for 30 years, bringing information to Apple techs, consultants, and support personnel since the mid-1980s. Associated with the magazine are a number of MacTech events, including the flagship MacTech Conference. For 2015, editor-in-chief and publisher of MacTech Magazine Neil Ticktin has announced that the company will host one-day MacTech Pro events to be held in nine cities across the United States. 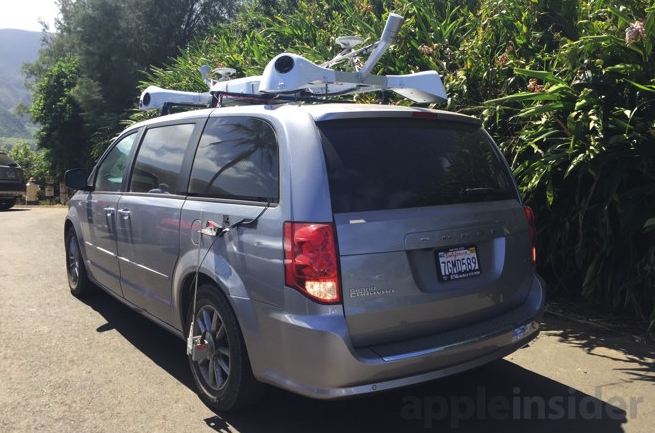 Latest Apple mystery van sightings occur in California, Florida, Hawaii — Apple’s mapping efforts appear to be growing, as AppleInsider readers continue to spot mysterious sensor-laden vans, just like the ones previously confirmed to be registered to Apple, roaming around the United States. Adobe reckons its future is mobile. Apple looking at public beta for iOS 8.3, iOS 9 — Apple’s public beta program for OS X Yosemite was quite successful, providing many Mac users who aren’t developers with the opportunity to try out the latest desktop operating system while increasing the size of the pool of testers. 9to5Mac is reporting Apple’s considering a similar public test of the upcoming iOS 8.3 beta (due in another month or so) and iOS 9, which will presumably arrive later this year. Microsoft OneNote gets handwriting support on the iPad, OCR everywhere — Microsoft recently announced a major feature update to OneNote for Apple’s slate, adding a standard feature found on OneNote’s other platforms: digital pen support. The latest version of OneNote for iPad brings handwriting and drawing, allowing you to make sketches on your slate. Meanwhile, Photoshop is toasting its achievement with a 60-second spot that will air during this Sunday’s Academy Awards. The ad spotlights works of art from Behance, Adobe’s collective of Photoshop creators, and also shows which tools were used to create certain effects. Fitbit Surge, an iPhone-connected health & fitness tracker — Neil Hughes writes “For iPhone users seeking a wrist-worn fitness tracker with GPS, heart rate monitoring, and multiple-day battery life, the Fitbit Surge is a good tweener’ device — not quite a smartwatch, but much more functional than a basic wearable. Audio puzzler for iOS, Dark Echo, is all sorts of creepy — You can’t see anything. You take a step. You hear the sound travel through a long hallway, and come back to you … this is a very interesting take on a game that will have you straining your ears. It’s NZ$2.59. If you think your MacBook Pro is one of the “bad apples”? You can check by using Apple’s “check your coverage” tool. Apple fixing MacBook Pros with video problems free — Some people have been having issues with MacBook Pros sold between February 2011 and December 2013. On Apple’s support pages, a huge discussion of the problem had been raging for years. Only a small percentage of all of the MacBook Pros made during that period are affected with the problem: it manifests itself as distorted or missing video and random restarts. The devices include 15-inch and 17-inch MacBook Pros manufactured in 2011, and 15-inch Retina MacBook Pros from mid 2012 to early 2013. Starting today, Apple is offering a free fix. Steve Jobs talks higher education in 1998 interview — The Chronicle of Higher Education conducted an interview with Steve Jobs at an interesting time in 1998. It was shortly after his return to Apple, but before the iMac’s introduction. In the previously unpublished interview, Jobs discusses the higher education market and Apple’s future. Apple Maps Connect service for small businesses extended beyond US borders — Following a brief outage on Thursday, the Apple Maps Connect Web portal returned to service with new German and French language options, suggesting the service is slowly rolling out internationally. It looks like France, Germany and England will get it, anyway. Apple reportedly in talks to build $1.7B plant in partnership with Japan Display — Apple may soon secure a more stable source for small to medium sized device displays, as the company is said to be in talks with Japan Display on a $1.7 billion manufacturing plant. Apple says Mac app makers must transition to ARC memory management by May — In an announcement posted to Apple’s developer portal on Friday, the notified app makers that all Mac App Store submissions will soon be restricted from using garbage collection in favour of the Automatic Reference Counting (ARC) compiler feature.